I first came to know about the ‘three wise monkeys’ in some random book that I read when I was a kid. The first monkey covers its eyes, the second covers its eyes while the third covers its mouth. 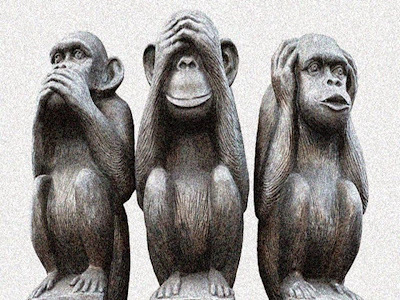 The wisdom that these monkeys are supposed to convey is that you should ‘see no evil’, ‘hear no evil’ and ‘speak no evil’. I mentioned the ‘three wise monkeys’ for a reason. Forget wisdom, they can teach you a lot about body language. When we were children, all of us acted like the three wise monkeys. If we saw something that we didn't like or were afraid of, we covered our eyes with one or both of our hands. If we heard something we didn't want to hear, we covered our ears and if we had to prevent ourselves from speaking what we didn't want to speak, we covered our mouths. When we grow up and become more conscious of ourselves, these gestures begin to seem way too obvious. So we modify them so as to make them more sophisticated and less obvious to others. As adults when we want to ‘hide’ from a situation or don’t want to look at something, we rub the eye or scratch the area around it, usually with one finger. Tilting or turning the head away and scratching the eyebrow is the most commonly observed form of this gesture. It should not be confused with the positive evaluation gesture where no scratching is involved (only one stroke across the length of the brow). This gesture is common among men and they do it when they feel embarrassed, angry, self-conscious, anything that might make them want to ‘hide’ from a given situation. When a person is lying, he may subconsciously try to hide from the person he’s lying to and so he might do this gesture. However, you got to be careful. It may also be that he’s just nervous. If you believe that he had no good reason to lie and nothing to be embarrassed or nervous about, then you should try asking him more about the topic to figure out the real reason behind his ‘hiding’. Picture this: you’re in a business setting and offering a deal to someone. When they hear the deal, they cover both their ears with their hands and say, “That’s great, sounds like something to look forward to”. Will you be convinced that they liked the deal? Of course not. Something about that gesture puts you off. 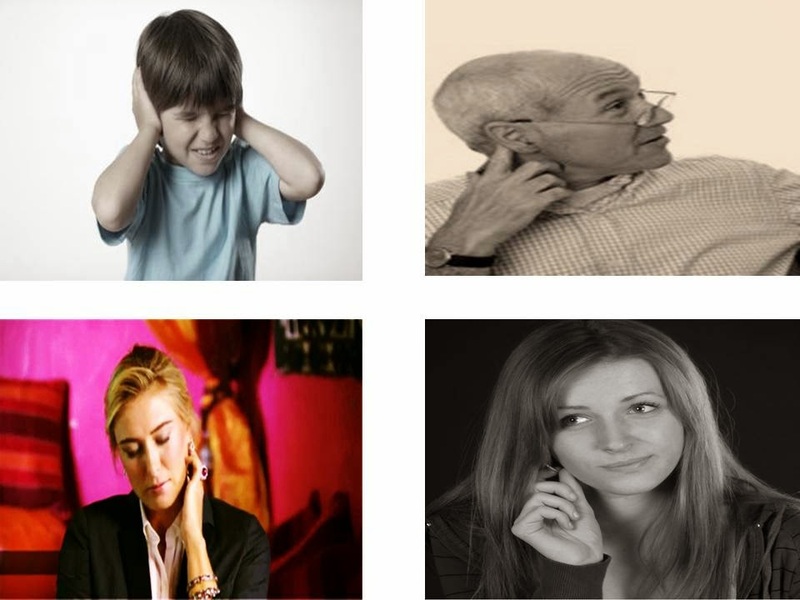 This is why people cover their ears in a much more subtle way when they don’t like what they hear, so that others may not detect it. This happens unconsciously and they may be totally unaware of what they're doing. Instead of covering the ear, adults block what they are hearing by touching the ear, pulling it, holding it, rubbing it, scratching it or the area around it- the side whiskers or the cheek. If they're wearing an earring, they may fiddle with it or pull it. Some people go as far as bending the entire ear forward to cover the ear hole, so much for the whole purpose of non-conspicuousness! When you’re talking to someone and they do this gesture, know that something is putting them off or it might just be an itch. The context alone should give you a clue whether or not it was just an itch. Still, to confirm, mention the topic again after some time and see if the person again touches their ear or uses any other ‘hiding’ body language. Then you’ll know for sure. In short, when a person hears anything disagreeable, even if they're his own words, he's likely to do this gesture. It’s the same story with the mouth. 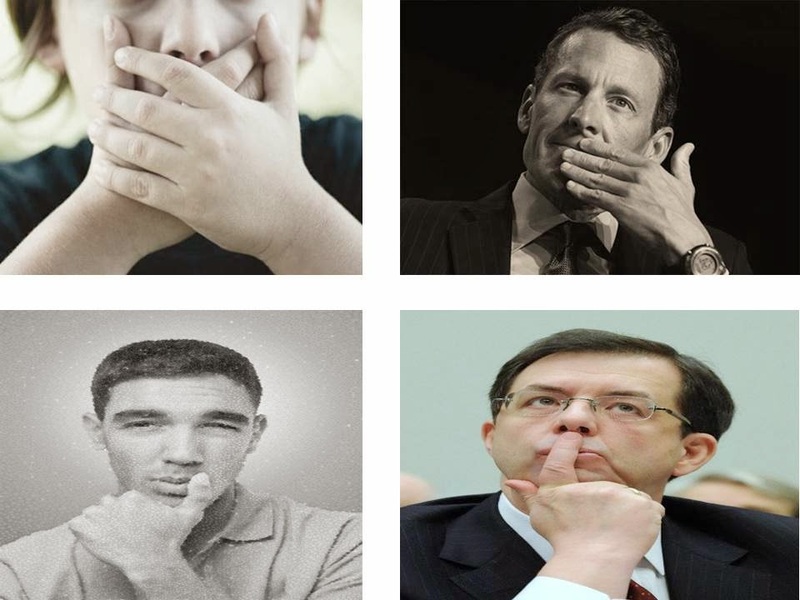 Instead of covering their mouths in an obvious way, adults touch their mouths with their fingers at different places or scratch the area around it. They may even place their finger vertically on closed lips (as in “shhh…keep quiet”), preventing themselves from speaking what they think ought not to be spoken. In a debate or in any similar discourse, if a person hasn't spoken for a while and is suddenly asked to speak, he may feel a bit hesitant. This hesitation may leak out in his body language in the form of a slight scratching or rubbing of the mouth. Some people try to disguise the mouth cover gesture by giving a fake cough. For example, in a party or in some other similar social setting, if your friend has to tell you a dirty little secret about X, he’ll cough, cover his mouth and then tell you about it, especially if X is also present. When you're talking to someone and they're in some way ‘covering’ their mouth, then they might be withholding an opinion or they might simply not agree with what you have to say. The audience members who cover their mouths when they hear a speaker speak are usually the ones that raise the most sceptical questions once the speech is over. We also cover our mouth when we are surprised or shocked but the reasons in such situations are different and obvious. Also keep in mind that some people may habitually touch their eyes, ears or mouth and it may have nothing to do with the way they're feeling. That's why I say context is everything.